Put an “HMS” in front of the word “Hawk” in the title of this post and one might think it describes some World War II duel between a German U-boat and a British destroyer, but in fact the “Hawk” in question is any Federal Reserve official inclined to tighten monetary policy, and the “U6” lurks not beneath the frigid waters of the North Atlantic but rather in the data of the Bureau of Labor Statistics, though it’s certain to surface at this week’s Jackson Hole conference on central bank policy. A broader measure of distress in the labor market than the U3 statistic generally referred to as the unemployment rate, U6 reflects not only unemployed workers but those who are “marginally attached,” including those with part-time jobs wishing for fuller employment as well as potential workers discouraged or otherwise incentivized to cease looking for work. Thus, U6 represents hidden slack in the labor market, a reserve of individuals whose potential reentry into the workforce could help contain wage inflation even as the Fed maintains unusually accommodative monetary policy. 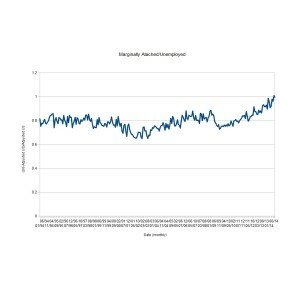 The data goes back to the beginning of 1994, when the BLS began tracking marginally attached workers and computing U6. As the chart shows, for most of the last twenty years the ratio has floated around .8, falling at times to a bit above .6 and rising to a little below .9 on occasion. Yet, in the current recovery, the ratio has risen to unprecedented heights (especially in the last few months) rising above 1 for the first time in June even as U3 itself declined (in July the ratio eased slightly to just above .99). 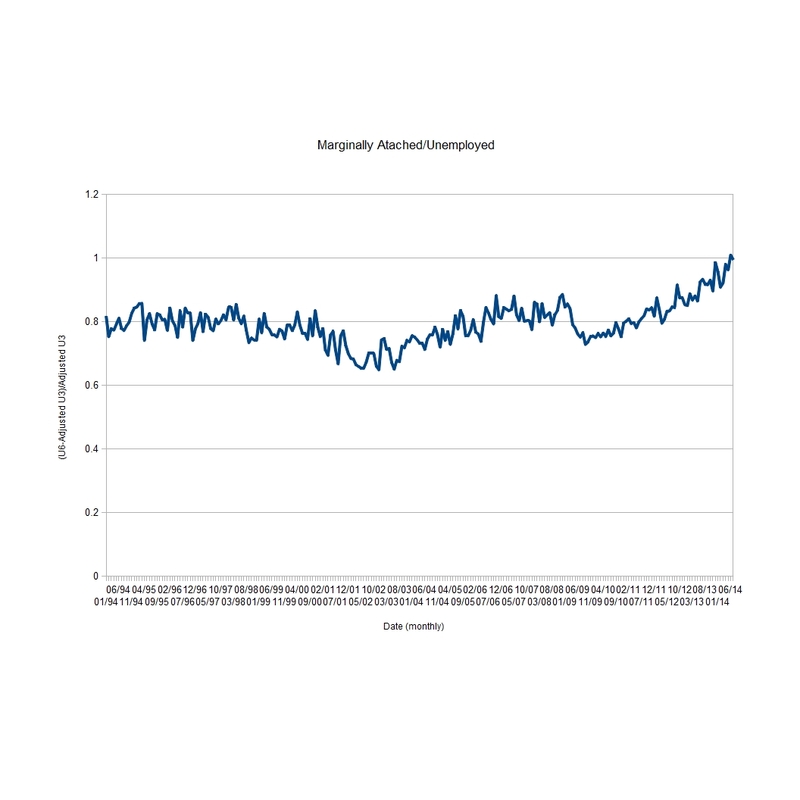 This reflects the fact that even as U3 unemployment has fallen, a large pool of jobless or underemployed have remained in that unhappy position and uncounted in the generally reported unemployment figure. The bottom line is that for every person officially unemployed there is another either not looking for a job or desiring more work than they have been able to attain. That spells enough hidden supply in the labor market to potentially discourage accelerated tightening, even as just released Fed minutes indicate increased hiring has made some FOMC members hopeful of a chance to raise rates sooner rather than later. Unless U6 dives a fair bit deeper, it remains poised to torpedo the hawk’s plans for an early return to more “normal” monetary policy. *Since the BLS uses the civilian labor force alone for the base in calculating U3 and adds marginally attached workers in figuring U6, the ratio here is computed by taking the ratio of the difference between U6 and an “adjusted” U3 to that same adjusted U3, the adjustment consisting of multiplying U3 by the sum of the civilian labor force and marginally attached workers, then dividing by the civilian labor force. All figures are seasonally adjusted except attached workers, which the BLS does are not seasonally adjust though it uses that series in calculating seasonally adjusted U6. As the prospect of Brussels hosting yet another euro-summit showcase of intransigence and impotence looms before us, even the redoubtable Angela Merkel may be forced to contemplate allowing the European Central Bank to become quite a bit more like the US Federal Reserve. Otherwise, European divisions made obvious during the latest Greek elections may become irresistible tidal forces as the crisis reaches Spain and Italy, opening an economic chasm into which even Germany could fall. In the wake of two rounds of “quantitative easing” that have left the Fed owning about 12% of US Treasury debt, the Fed has announced its intention to continue attempting to stimulate the economy by extending “Operation Twist,” selling shorter dated Treasuries and buying longer maturity T-bonds in order to bring down long-term borrowing costs (see “Uncle Ben’s Reverted Price”). But US long rates are already quite low, indicating that, at least for the moment and despite past and potentially future fiscal fireworks on Capitol Hill, the bond markets remain rather unconcerned about US credit quality. This may be in no small measure due to the Fed’s demonstrated willingness to purchase massive amounts of Treasuries. By contrast, as euro-crisis contagion spread from Greece to the rest of the periphery, the sharp rise in the yields of Spanish, Italian and of course Greek debt speak to markets’ deteriorating faith in these credits. For a time these rate hikes were held in some check by ECB sovereign debt purchases; since 2010 the central bank has bought some 200 billion euros of Portuguese, Irish, Italian, Greek and Spanish (PIIGS) paper, creating a degree of precedent for this kind of strategy. However, unlike the Fed, the ECB’s constitution does not include a mandate to pursue full employment in addition to maintaining price stability, so the euro’s central bank was forced to act in the name of maintaining the integrity of the banking system, whose collapse could be deflationary. Two German ECB members took such exception to this rationale that they resigned in succession, reflecting Germany’s traditional post-war concern regarding inflation. For Mario Draghi, the ECB president who recently highlighted the limits to what the central bank can do absent fiscal and structural reform in Europe, much more substantial action would likely require German support, and the quid pro quo of at least a somewhat credible promise of that reform. Like their American counterparts, the yields on German bunds are quite low. And for Germany as for the US, these low yields are not due to low debt to GDP ratios, as the German figure is now near 90% and likely to rise significantly higher with the announced issuance of Deutschland bonds through which the central government will back borrowing by German states. Rather, both the US and Germany are in some sense in command of the mechanism for creating the currency in which they borrow; for the US this power is unambiguously invested in the Fed, while Germany enjoys a kind of negative control of the ECB, since with the exception of Finland and the Netherlands, the rest of the eurozone seems to have little objection to money creation through policies such as sovereign debt purchases. A crucial point here, and one readers of this blog will be familiar with, is the difference between real default on sovereign debt caused by inflation and nominal default, in which the bonds do not fully pay off, even in a depreciated and inflated currency (see “Europe Learns To Default The American Way, Restoring Transatlantic Balance Of Irresponsibility”). Because the latter does not result in an inability of banks and other holders of bonds to meet their obligations (like deposits) payable in the same currency as the bonds, the real default of inflation, though potentially quite pernicious, may not precipitate acute systemic financial crises, and thus institutions may be willing to hold debt at risk of inflation but not nominal default. So at least until the inflationary crows hatched by monetization come home to roost, a central bank’s buying of its currency’s sovereign debt may lower yields on that debt, as may even the possibility of such buying, based on the central banks’ ability to make such purchases. Germany is understandably wary of letting profligate states borrow on its credit card. If it’s serious about not allowing eurozone-wide “Eurobonds” to refinance peripheral debt, and with the necessarily limited firepower of bailout funds like the European Financial Stability Facility (EFSF) and its successor, the European Stability Facility (ESM) limiting their credibility, an ECB with the theoretically unlimited power of the monetary printing press may have to be the buyer of last resort for the debt of the PIIGS, effectively creating euros to re-liquify the banking system, preventing runs and reflating the eurozone’s economy. For Germany, staying in the euro absent such an action could mean the loss of its periphery export markets while its own bank exposure to those countries drags the German economy down (see “It’s Hard To Make That German Export Wiener Without PIIGS – And That Goes For Chinese Dumplings, Too.”). Alternatively, a report from Merkel’s own government puts the cost of an exit from the common currency at 500 billion euros, with a 10% GDP drop and five million Germans unemployed. Ah, but there’s the matter of those inflationary blackbirds I mentioned, and an old Spanish saying – if you raise crows they will peck out your eyes. With eurozone inflation running at 2.4% in May and the German rate even lower (1.7% in June), the ECB has some inflationary breathing room, ironically due to a global economy weakened by the euro crisis itself. Yet Germany’s concerns are well founded, and in exchange for a more Fed-like ECB it could and should insist on rapid reforms in Europe. These would have to go beyond austerity and the purely fiscal, embracing structural changes addressing woefully low competitiveness in much of the eurozone. Only then can there be confidence in a limit to monetization and any hope of peripheral countries paying debts current and future. Clear milestones and a commitment to a time scale much faster than the ten years contemplated in European Council President Van Rompuy’s plan would be essential. Unfortunately, the most serious opposition to such reform is likely to come from the new French government, which would have to reverse the newly elected François Hollande’s support of earlier retirement benefits and restrictions on layoffs even as French competitiveness dives. But hey, what in the last two hundred years of Franco-German relations would cause one to doubt that France and Germany can’t work things out? If they continue on their current course, the architects of America’s fiscal and monetary policies might want to consider the above revision to Emma Lazarus’ great exhortation on the pedestal of the Statue of Liberty. For it is in no small measure the flight of capital from investment on other shores that’s has been driving down yields on United States Treasuries, allowing the US to borrow with remarkable abandon despite ratings downgrades and Washington’s ongoing budget follies. As forbidding as the US debt and deficit might be, last year investors continued to bid up America’s debt, lowering the interest cost to finance economic stimulus programs while keeping tax rates unchanged. This injection of capital has almost certainly helped to spur the nascent US recovery, just as some economists argue pre-war European flight capital helped lift America out of the Depression in the later 1930’s. Washington has had various factors to thank for the easy credit terms the world continues to offer. From Iranian saber-rattling to Japanese earthquakes, many forces served to drive frightened capital into the arms of the US Treasury market. However, at the top of the list is surely the political leadership of the Eurozone. The Obama-Boehner show has nothing on the extravaganza headlined by Merkel and Sarkozy, with a supporting cast of various and changing guest stars governing the solvency-challenged PIIGS (Portugal, Ireland, Italy, Greece and Spain) and of course the folks at the IMF and ECB (every comedy needs a few straight men and women, after all). This noisome cavalcade had provided a continuous flow of confidence-shaking news, keeping sovereign default risk and systemic shock ever present in investors’ minds. Meanwhile, the US has muddled through a budget deal which, while insufficient in the long run, indicated some capacity for concord even in the current poisonous political atmosphere. Similarly, the Fed, aided by TARP financing, seemed to succeed in stabilizing the American financial system. Through late in 2011, the result was an increase in the cost of euro-denominated borrowing for key large Euro sovereigns with the exception of Germany, the yield on whose bunds declined almost in lockstep with a simultaneous drop in US Treasury bond yields. At the time of this writing, with the “voluntary” Greek debt restructuring talks dragging on, observers may understandably have a difficult time conceiving of an end to “Euro-fear.” Nevertheless, it is precisely the possibility that, with or without Greece in it, the Eurozone will find a way to get its house in some kind of order that threatens America’s ultra-low borrowing costs. We are in fact seeing some tentative signs of, as Churchill put it, not the end or even the beginning of the end, but perhaps the end of the beginning. New ECB president Mario Draghi’s Long Term Refinancing Operation ostensibly provides a three-year, multi-hundred-billion euro stabilization line of credit to European commercial banks, but as the ECB is “allowing” (read: encouraging) those banks to use this credit to buy better European sovereign bonds (and avoid having to dump weaker Euro nation credits in bulk) what we’re really seeing is a back-door program to lower European states’ borrowing costs. Because the ECB loans represent money created by the central bank, this is a form of bailout that does not require direct taxation of “core” European nations citizens (e.g. Germans), though to be sure, they may end up paying the price through inflation (see “Europe Learns To Default The American Way, Restoring Transatlantic Balance Of Irresponsibility”) and devaluation, though export-driven economies like Germany actually need a weaker currency more than they might like to admit (“It’s Hard To Make That German Export Wiener Without PIIGS – And That Goes For Chinese Dumplings, Too”). Second, whether or not the Greek debt restructuring talks result in a formal default or an effective one (and the contemplated 70% write-down will surely be a default in fact if not in name) is not so important as whether the process is orderly. So long as any any write-offs and triggered credit default swaps are handled in a way that does not lead to bank runs and frozen markets, such an event could be kept contagion free. There is no guarantee such a systemically benign scenario will play out, but the aforementioned willingness of the ECB to inject liquidity on a massive scale does provide reason for optimism. And therein lies the rub for US government borrowing costs: as the Eurozone crisis subsides, so may the safe haven “panic bid” on US Treasuries, causing the yields on those bond to rise and further increasing the burden on American taxpayers of financing the deficit. Indeed, the 10 year US Treasury yield has crept up from below 1.87% in late November of last year to over 2.02%, while conversely (and despite it’s own rating downgrade), France’s ten year debt yield declined to below 2.90% since spiking above 3.73% during the same period. Similarly, the Italian 10 year yield dropped from over 7.36% to less than 5.49%. To be sure, there are significant benefits to the US economy in this “risk-on” shift; the reduction in Eurofear has bolstered equity markets with a knock-on wealth effect boosting consumption and, yes, tax-revenue even in the absence of a rate hike. Even so, higher T-bond rates translate into an increased cost of servicing America’s heavy debt, so even if the core Euro countries seem to be picking up the tab, their Greek holiday may not come without cost for Uncle Sam. N.B. : One advantage of a weakened euro – cheaper French wines (in dollar terms), and in particularly that said-to-be-excellent 2009 Bordeaux vintage; for insight into this and all things vino, check wine expert (and Duke econ grad) Jessica Bell’s very excellent webcasts at MyWineSchool.com. It’s Hard To Make That German Export Wiener Without PIIGS — And That Goes For Chinese Dumplings, Too. With all the flack Angela Merkel has taken at home for agreeing to help bail out Greece, one could be forgiven for wondering why the Chancellor would want to yolk Germany’s seeming paragon of export-driven economic strength to the Hellenic basket case, let alone to the fortunes of those other peripheral euro states that, with Greece, are collectively known as PIIGS (Portugal, Ireland, Italy, Greece and Spain). Perhaps counter-intuitively, part of the answer lies in the fact that German exports are actually made more competitive because of the weakening of the euro caused by the participation of the PIIGS in that currency. A weaker euro means relatively cheaper prices for German goods in the currency of non-Eurozone trading partners, giving German exporters an edge in world markets. To understand this effect, one must first consider two histories: that of the euro since its birth, and of German exports prior and subsequent to that introduction. For all its troubles, the euro has strengthened considerably since its first day of trading, January 5, 1999. It hit $1.19 that day, but by December 3 of the same year it fell below parity with the dollar. The currency has since risen over 40% to $1.4172 as of this writing (it hit a high of $1.5892 on July 7, 2008). Now this appreciation versus the greenback has occurred despite the presence of the PIIIGS in the eurozone, with all the systemic risk that their potential sovereign defaults pose to European banking and economic growth. Imagine how much higher the euro might trade were the PIIGS to exit Euroland’s pen, remaking the euro into something more in the image of the old German mark! So how did German exports fare before and after it traded marks for euros? From January 1991 to January 1999, under the old mark (1991 being the first full year following reunification) German monthly exports rose from around 30 to 40 billion euros, an increase of about 4% per year. By contrast, in the euro period from January 1999 to January 2011 Germany’s exports rose to over 80 billion euros per month, an increase of over 6% per year (German exports dropped sharply during the ’08-’09 financial crisis but have subsequently more than rebounded, hitting 97 billion euros in April 2011 before easing to 85 billion in September). Would German exports have risen as sharply were the nation still using a mark, reflecting solely that nation’s monetary policy, as opposed to a euro in whose valuation German export strength, traditionally tight postwar German monetary policy and relatively conservative German fiscal policy are diluted by the PIIGS’ trade weakness and profligate budget policy, not to mention power sharing in the European Central Bank? I strongly doubt it. To be sure, 60% of German exports still go to the EU, where the euro’s exchange strength would be irrelevant. But it is trade with China that is providing the growth in German exports, having risen four fold over the last ten years to rival the US as Germany’s largest single national market at 5.6% of the nation’s foreign sales, a figure that may triple by the end of this decade. This ballooning China trade is in turn driving German economic growth. Without the squealing PIIGS of the Eurozone’s periphery, a stronger euro could make German goods less competitive and have serious consequences for continued China-trade driven economic expansion. There is perhaps some irony that, in addition to a “voluntary” 50% markdown in Greek bank debt, Europe is turning to China in hopes of having that nation finance some of the expanded $1.4 trillion European Financial Stabilization Fund, perhaps directly or through the IMF. Like Germany, China’s expansion is dependent on exports, and the global slowdown that could come in the wake of a euro collapse would threaten those sales. Meanwhile, Chinese inflation is still running high, driven by an undervalued yuan and tight commodity markets, so Beijing may also find continued euro-discounted German manufactured imports not unwelcome. And investment in euro assets provides China with some diversification from its substantial dollar holdings. Chinese investment could at least lessen the need for debt monetization (see “Europe Learns To Default The American Way, Restoring Transatlantic Balance Of Irresponsibility”) and/or the issuance of Eurobonds directly backed by German taxpayers, perhaps under some kind of Eurozone fiscal union. That would be welcome news for Merkel. The former is anathema to a nation whose prewar experience with inflation had the darkest of consequences. As to the latter, Germany’s 83% debt-to-GDP ratio (it may hit 87% in short order, jumping from approximately 67% in 2007) is not at Greek or even American levels, but still speaks to Germany’s own bloated welfare state, which combined with past and potential bank bailouts, stimulus and Eurobond exposure to the PIIGS could yet make even German borrowing unsustainable, bringing us back to monetization and inflation. So fortunately for Merkel, China seems to realize PIIGS are a desirable ingredient in dumplings as well as wieners. It remains to be seen if Beijing’s investments will eliminate or merely forestall the need for stronger measures. The Chancellor recently warned that the issuance of Eurozone debt and fiscal union would lead to “solidarity in mediocrity.” Yet when your export-led economy is partially built on the weakness of your currency partners, some economic convergence may be inevitable; a cruel truth, perhaps, but then they don’t call it reversion to the “mean” for nothing. Standard & Poor’s lowering of the United States’ Treasury rating from AAA to AA+ seems to represent as much an expression of no confidence in the democratic process as it is a rejection of the recent deal to cut the deficit and raise the debt ceiling. The Wall Street Journal reports a Treasury Department claim that, prior to its decision to downgrade, S&P erred by essentially using a CBO “alternative” scenario for projecting the rate of deficits, as opposed to the “standard” baseline scenario. The result was a $2 trillion increase in the projected national debt over ten years (but hey, what’s a couple of trillion between friends?). This assumption would effectively counterbalance all but $400 billion of the $2.4 trillion in deficit reduction under the pact, providing only 10% of the $4 trillion increase S&P had warned would be necessary to avoid a downgrade. According to the WSJ, when Treasury pointed out what it considered a “glaring mistake” to the rating agency, a “jarred” S&P decided to downgrade anyway, but changed the emphasis of their argument from the agreed-upon level of deficit reduction to “dysfunctional Washington political culture” and the “political setting.” In particular, S&P noted their pessimism regarding the challenge of making further progress in light of the difficulty of finding the narrow common ground achieved in the agreement. Now one could be forgiven if one’s visceral sense of confidence in the republic is not bolstered by watching the President and Congressional leaders put on their version of a fiscal policy cage match. Yet realistically, had the debt ceiling’s increase been delayed, Treasury could have prioritized, servicing the debt and delaying payments for entitlements, employees, contractors and so forth. More to the point, a nation that borrows in its own currency and thus can print money to pay its debts presents little risk of default. This is precisely the difference between the United States and the individual members of the Eurozone. To be sure, if monetizing the debt results in higher inflation, my view is that this constitutes a kind of real default (see “Europe Learns To Default The American Way, Restoring Transatlantic Balance Of Irresponsibility” and “The “Pained” Consumer Price Index”) but the risk reflected in credit ratings meant to be that of nominal default, of not getting back the currency you’ve loaned with the promised interest. What that currency’s future purchasing power or value in terms of other currencies might be for the future is an issue of great economic importance but beyond the scope of credit ratings, and for good reason. The nominal default of inflation and devaluation leaves the lender paid in the debased currency to service its own prior obligations fixed in that currency. The institutional and systemic risks of a “real” default are not present. Thus, as inflation and devaluation ravaged the value of the dollar during the 1970’s, for example, no downgrade of US debt occurred, and the global financial system continued to rely on the greenback as its reserve currency without skipping a beat. With the US able to print its debt service, complaints over the speed of America’s democracy reaching consensus and that demand for an immediate $4 trillion deal seem curious at best. Some clue to the underlying logic might lie in the UK’s retention of its AAA rating despite a higher debt to GDP ratio than the US. Standard and Poor’s justifies this by stating its greater faith in the UK’s political process and Downing Street’s ability to execute its deficit-reduction plan. It is true that Great Britain’s parliamentary system gives far less power to the opposition party than that allowed by the US constitution. Implicitly, it strikes me that what S&P longs for is the stronger hand of an executive, with less of the debate and consensus-building America’s system demands in the name of freedom. For two centuries and more critics have doubted that America’s raucous democracy could govern, let alone face the challenge of determined rivals. At various times those voices were heard in Kabul, Moscow, Beijing (reprising that song today) Berlin, Tokyo, and long ago even Whitehall. We’ve heard them from our own as well; Joseph P. Kennedy’s “democracy is finished” edict comes to mind. Yet I would argue that the genius of our system is to be found in moments like this, when such disparate and diametrically opposed world views as those of Barack Obama and Eric Cantor can be reconciled to produce agreement – partial, imperfect and requiring further work bur agreement none the less, and, in the end, with the consent of the representatives of the vast majority of the electorate rather than only of a majority ruling by narrow margin over its opponents, let alone of an absolute ruler. That genius of American democracy can be hard to discern sometimes, over strident partisan voices on CNN and Fox (and today perhaps CNBC and Bloomberg). Perhaps to appreciate this brilliance one might paraphrase Swift’s famous observation, noting that when true genius appears in the world, it may be known by this sign, that the dunces are all in confederacy against it.